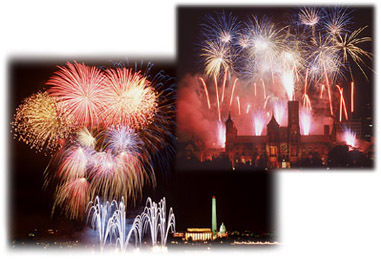 Please join us Washington, DC on Friday, December 31, 1999 for the countdown to the new millennium including light and laser shows with fireworks to the sounds of choirs and orchestras. The Midnight Moment will be a spectacular high-tech sound and light display between the Lincoln Memorial and the Washington Monument that will be the nation's salute to the new century. Citizens from across the nation will be able to come together and share this extraordinary moment in history live on television. It will conclude with American children - joined by the stars of the gala, choruses and the hundreds of thousands of celebrants on the Mall - raising their voices in a rousing sing-along to lift our hearts in the first hour of the new millennium. America's Millennium Gala will be a night to remember - an historic event in which every American will want to be included. It will be telecast to the world, broadcast on radio, and transmitted by special arrangement on the Internet via the World Wide Web. A list of participants will be added to this page as they become available.